This humanistic sans serif design was inspired by a conversation that David Quay had with renowned type designer Hans Meyer, during ATypI in Paris, 1989. Meyer revealed that Sabon, designed by Jan Tschichold, was the inspiration behind his Syntax font. This approach formed the basis for the design development of The Foundry’s very first sans serif typeface family; the inspiration for Foundry Sans comes from Stempel Garamond. 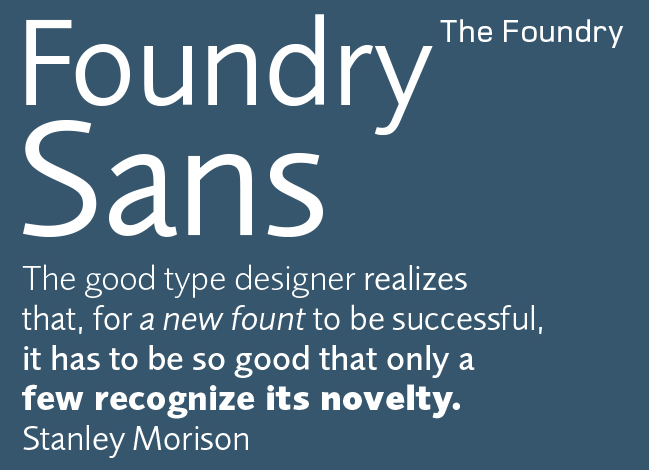 Foundry Sans was the second typeface to be released for The Foundry typeface library in 1990. A font description published on Wednesday, January 15th, 2014 in Fonts, Monotype, The Foundry by Shelly Runyon that has 4,107 views.